Hey, how's that for flattery, buyers ?? Actually, an extremely helpful & knowledgeable collector came through for us. 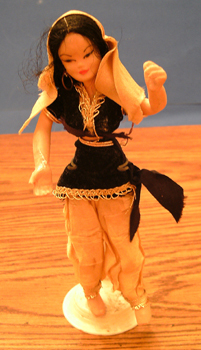 She has black hair and a gold colored long veil with matching gold colored pants with gold cuffs on the bottom of her legs. She is wearing a soft velvet feel black top and matching wraparound skirt. She has no shoes and has a stand. These are used with no boxes. They are not without flaws. Some have frizzy hair, small tears in the clothing, could be missing accessories or ??? The stands are plastic at the base with a metal post. The stands say "Industrial Specialties N.Y.C." on the bottom and most of them are dirty or have some sticky substance by the feet. Overall, they are in pretty good condition but could use a better cleaning.